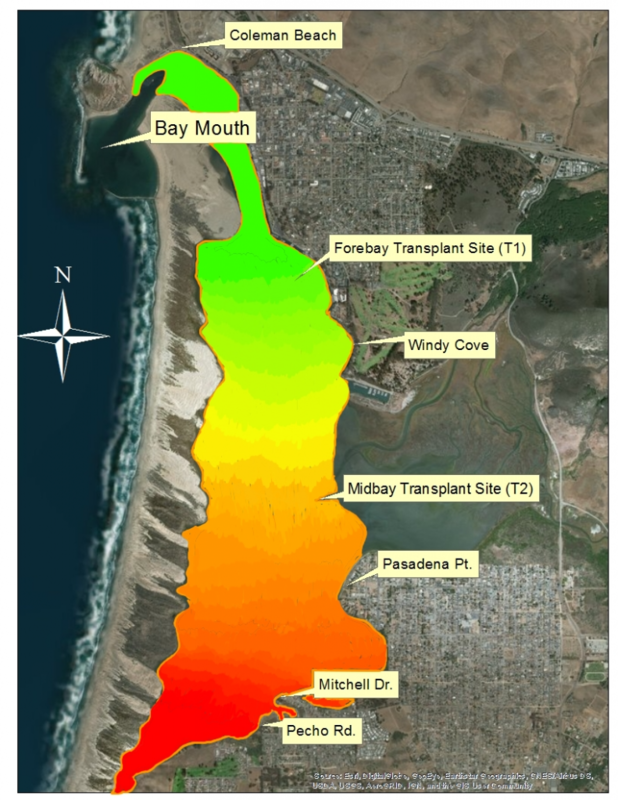 In the first two blog posts of the Factors that Affect Eelgrass Growth in Morro Bay series, we learned that there are many factors that influence eelgrass growth in estuaries. 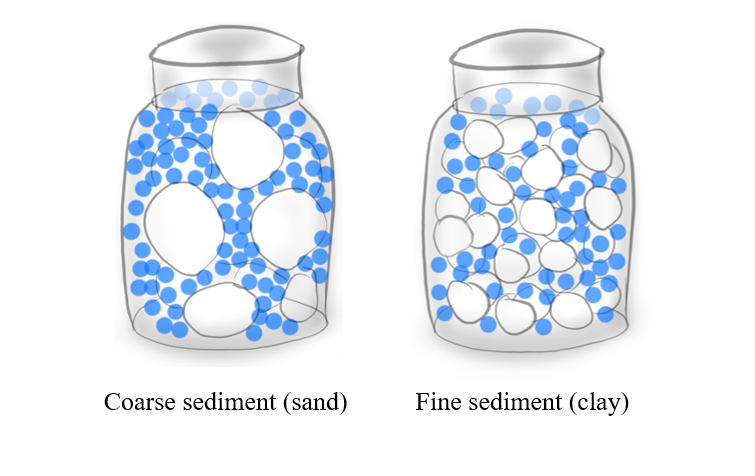 In this two-part post, PhD candidate Erin Aiello explores the importance of light levels and sediment properties and how they change across the bay. This is the second half of the post; read the first half here. Erin Aiello, guest author. Photograph courtesy of Kyle Nessen. Erin Aiello is a native of the central coast, having grown up in Cambria. She spent most of her childhood running barefoot through pine forests, which instilled in her an undying love of nature. Erin received her BS and MS degrees in Biology from Cal Poly in San Luis Obispo. While she studied at Cuesta College, Erin volunteered at Pacific Wildlife Care as a rehabilitator of sick and injured wildlife. Erin’s love of wildlife led her to pursue ecosystem restoration upon transferring to Cal Poly. She found restoration to be an impactful way to assist wildlife–and a way that she could connect with plants as well. Restoration has been the focus of Erin’s research through undergraduate and graduate school. During her MS work, Erin collaborated with the Morro Bay National Estuary Program to perform an experimental eelgrass transplant and to measure parameters in Morro Bay that are important to eelgrass health. Erin is currently studying the role of mycorrhizae in ecosystem restoration at UC Santa Cruz while she pursues a PhD in ecology. What might differences in sediment chemistry mean for eelgrass in different parts of the bay? Plants rely heavily on certain chemicals in the soil, such as nitrogen and phosphorus. Other chemicals, such as sulfur and mercury, can be toxic to plants, especially in high concentrations. To date, there is very little information about what sediment chemicals are most important for eelgrass survival, and what concentrations of these chemicals are tolerable for eelgrass. During my research, I analyzed the chemicals found in the sediment at sites that lack eelgrass and at sites where eelgrass is currently growing. I found an interesting pattern in the concentrations of some of these chemicals. Many were found in high concentrations at sites that lack eelgrass and in low concentrations at sites where eelgrass is currently growing. What’s more is that the concentrations of these chemicals increase gradually as you move south, farther away from the bay mouth. I’m going to call this the chemical gradient, because there is a gradient of high concentrations of most chemicals in the back of the bay to low concentrations at the mouth of the bay. The graphic below, which shows the hypothesized gradient, is not generated directly from data. Rather, the graphic represents the concentrations of most of the chemicals that I measured, with high concentrations in red and low concentrations in green. This map illustrates the general pattern of chemical concentrations across Morro Bay. High chemical concentrations are shown in red and low chemical concentrations are shown in green. Each chemical aligns with this chemical gradient pattern differently. 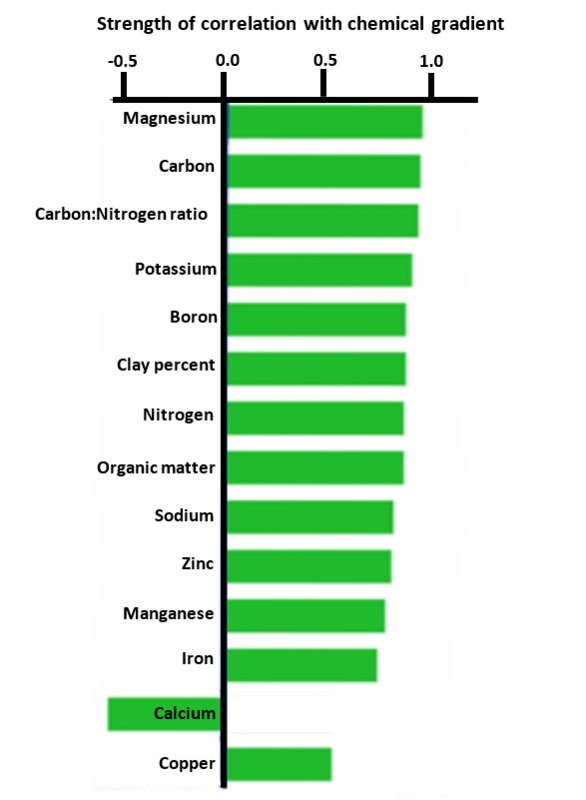 Magnesium follows the chemical gradient pattern more closely than other chemicals do. For example, while copper does change from a higher concentration in the back bay to a lower concentration at the mouth of the bay, the difference in concentrations is fairly small. In other words, though both magnesium and copper follow the chemical gradient pattern to one degree or another, magnesium concentrations correlate with it more strongly than copper does. The figure below shows how strongly each chemical correlates with this gradient. The longer the bar, the stronger the correlation. Now, you might notice that the calcium bar is pointing in the opposite direction. This means that the gradient of calcium is reversed: calcium is found in low concentrations in the back bay and gradually increases at sites that are nearer to the mouth. This graph shows how each chemical tested in the bay correlates with the chemical gradient. The gradient is positive for every chemical except calcium. Magnesium, carbon, potassium boron, nitrogen, organic matter, sodium, zinc, manganese, iron and copper are all present in higher concentrations in the back bay, where there is very little eelgrass and in low concentrations near the bay mouth, where eelgrass is more robust. Any of these chemicals could be negatively influencing eelgrass growth in Morro Bay. However, more studies are needed to understand how the differing concentrations of these chemicals might affect eelgrass growth. How does light affect plants? Like most plants, eelgrass uses sunlight energy to convert carbon dioxide and water into sugars. Think of these sugars as candy Lego blocks. 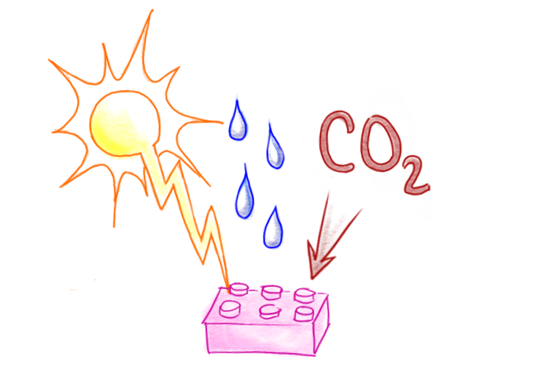 Much like you can build with candy Lego blocks, or eat them, plants use the sugars they make for energy and as building blocks for new growth. Without sufficient sunlight, plants can’t grow and don’t have the energy to survive. This is why sunlight and water are crucial to plants. Since eelgrass is no exception to this rule, I measured light in Morro Bay to see if there was enough for eelgrass throughout the bay, or if there was more light in one area than another. How much light is available for eelgrass in different parts of the bay? 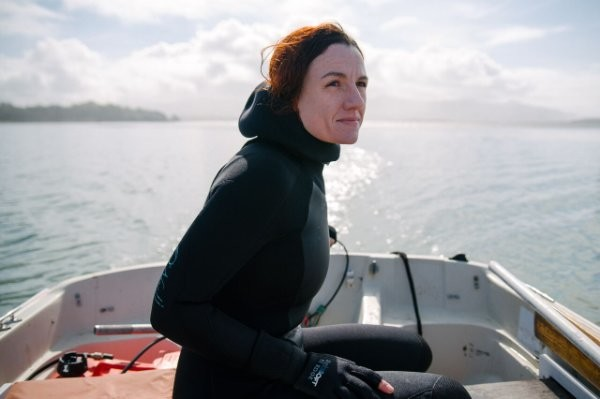 First, I measured light by placing two sensors at two different sites at the same time, both under the water, at the same height as about half-way to the tip of an upright eelgrass blade. I placed one sensor in the fore bay and the other in the mid bay for a few hours, measuring the amount of light detected by each sensor every ten seconds. Using this method, I found a large difference in the light levels measured concurrently at these two sites. 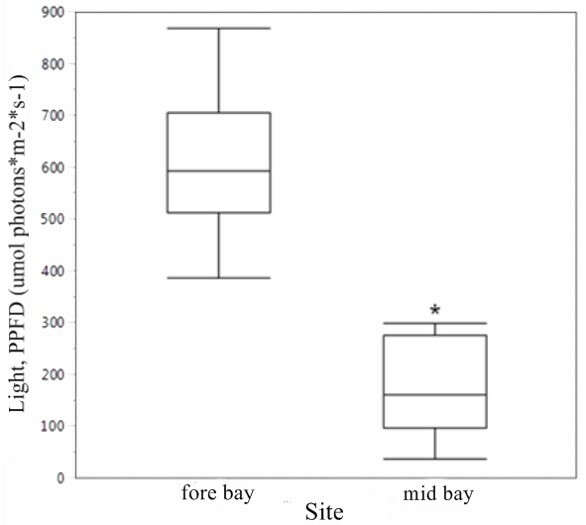 The fore bay site received much more light than did the mid bay site, as you can see with the below box plot. This box plot shows that eelgrass in the fore bay likely receives much more light than eelgrass in the mid bay. The middle line that divides the boxes is the mean, which is an average of all of the measurements taken at that site. What’s the main takeaway from this box plot? The fore bay site gets more light than the mid bay site does. At a later time, I submerged the light sensor underwater from the side of a boat, keeping it out of the boat’s shadow. I used the sensor to measure as I drove from the State Park marina in the fore bay to Baywood in the back bay, then back to the dock, two times. Using this collection method, I recorded light levels that were, well…all over the place. 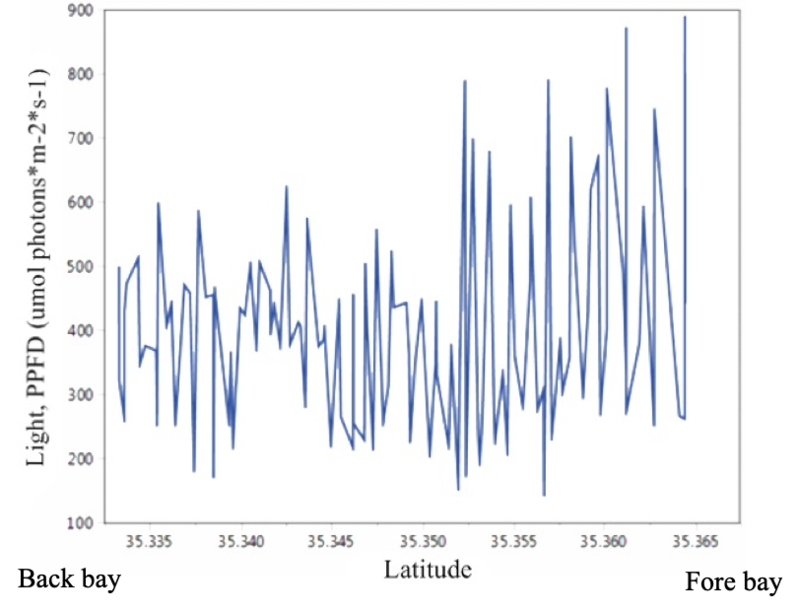 In this graph, you can see that light varies a lot in each section of the bay, but there is still a general pattern of higher light levels in the fore bay and lower light levels in the mid and back bay. How might sediment affect light levels, and what does this mean for eelgrass? Do you remember how the sediment is finer in the mid and back bay when compared with the fore bay? This may be influencing light levels, as finer particles are more easily suspended in the water column, making the water murky, or turbid. These results provide evidence that the fore bay is a more suitable site for eelgrass restoration. However, as eelgrass presence can clear the water and prevent particle suspension, conditions in the mid and back bay should become more favorable as eelgrass recovers nearby. Stay with us for future posts on our partners’ work with eelgrass in Morro Bay and updates on our ongoing eelgrass restoration efforts. Come to San Luis Outdoor Painters for the Environment (S.L.O.P.E.) show, Flowing Estuary to Living Sea, at the Morro Bay Natural History Museum’s auditorium. A portion of art sales benefit the Estuary Program and the Central Coast State Parks Association. Additionally, 100% of proceeds from a drawing for a print will benefit these nonprofits.